One of the circumstances in which I will always read a book more than once is when I am preparing to narrate it as an audio book. I know I should do it more, because it always helps me to appreciate a book much more, but as many other avid readers will know - so many books, so little time (this is even more true with small children to look after). The obvious strengths of Alderman's second novel lie in her characters, which are all nicely individual and well realised through dialogue and description, and in the unsatisfying way in which love fails to be realised by just about all of them. Further reading helped me to identify some of the subtle themes that she manages to weave into her story about a group of privileged youngsters at Oxford and their education in that more unforgiving of institutions, the University of Life. Our narrator is James, a middle-class boy who finds himself a small fish in a big pond when he follows his sister's footsteps and goes to Oxford. Consistently trying to keep his head above water he is dealt an early blow when he injures his knee while out running one morning. Falling further behind in his studies and at his lowest ebb he meets Jess. This was the chance I'd waited for. Here, if I said the right things, I could enfold her into my life, and wrap myself in hers, in the Oxford life I had somehow missed. Fear and panic engulfed me again, that I would not find the right words...And, to my own surprise and horror, I began to cry. That wish to be taken care of, to attach himself to someone else's life will become an important realisation later for James but for now, befriended by Jess it isn't long before he gets exactly what he wished for. Unknown to any but a select few, an unassuming wall on a backstreet of Oxford conceals a secret. At last we came through the tangle and out on to a stone-flagged area with two curved sets of stairs leading up to a crumbling Georgian house. It was enormous - the main section was three storeys tall, with seven windows along each floor, and its façade had faded into mottled beauty. The paint peeling in crackled strips from the shutters on the ground floor windows had scattered green and white shards across the paving stones. This is the home of Mark Winters, a charismatic fellow Oxford student with a trust fund lifestyle to make the eyes water - when James sees the balance of a bank account he suggests that a sum like that should be put somewhere better in order to earn interest to which Mark rather dismissively comments 'Oh, I think that is the interest on something.' Mark assembles a retinue around him, a surrogate family to replace his own (his father is virtually absent and his mother lives in Italy) which includes the musician Jess, Spanish seductress Emanuella, occasional lovers Franny and Simon and now James too - the beautiful paramour. When money is no object then it seems you can exist for a while in a daydream of parties, playtime and love affairs. The removal of responsibility is an indulgence for James who exists on a social plane several rungs lower than his contemporaries, but it is a danger too leaving them all ill-prepared for the complications of adult life. I won't go into too much detail about what those complications are but for James it is a journey which contains paradigm shifts in self-awareness and more than just a little heartache. Mark remains the book's most fascinating character, not only because of his humour and charisma, but also for his enigmatic qualities. Trying to piece together the history of this charming man who clearly hides deep psychological scars, hinted at by various other characters including the family's priestly confidante, is a bit like solving a riddle and Alderman, by making almost everything about him ambiguous in some way, leaves you questioning the truth of just about everything he says. A supposedly religious man he understands the notion of sacrifice, one of the novel's themes. It is just such a moment that brings James firmly into the fold when he offers himself up as the culprit when Mark's mother demands to know who broke a family heirloom. And it is that same spirit that provides Mark with his one redeeming action, a life-endangering act of selflessness completely out of character. I'm getting dangerously close to revealing plot points here so I'll leave it there. Alderman's book seems at first as though it will be a superficial tale of excess and sexual awakening but, just as its characters do, it matures into something far more complex. Youthful exuberance and ambition give way to disappointment and discontent before each of these indulged 'siblings' is forced to stand alone, separate from the institution that has bred them and the protection of their circle, and make their own life. I came here following from your comment over at A Common Reader. It strikes me that it sounds a bit like a cross between Bridehead and Ellis's Less than Zero, is that fair at all? It sounds very good, but very referential, my concern would be too referential. That said, neither you nor Tom found it so, so perhaps I'm being overly cautious. Glad to have lured you here Max. At the risk of exposing a gap in my reading I can't say how close the book is to either Brideshead or Less Than Zero but with its college setting it is almost bound to have similarities with them and other novels (Tom mentioned The Secret History and The Line Of Beauty). Much of the interesting stuff happens away from college of course and the real maturity of the book is definitely felt most once its characters are out in the big wide world. The surprise to me, and to Tom I think, was that the book's characters managed to make us care about their, frankly, privileged lives and elicit our sympathy. That requires some skill. We must have receive this at the same time. I enjoyed your review as its interesting to see a different perspective on a book you've just read. When it arrived in the post it almost went straight into my "discard" pile, but I'm glad I read it now. I've been listening to one or two episodes of Book at Bedtime of Radio 4 and was not so impressed. Perhaps it was better to race through the pages. It was just as nice for me to read your thoughts on the book too, Tom, especially as it was a while ago that I read it. I heard only a tiny bit of Rory Kinnear's reading on the radio - the problem I found when reading it for the unabridged audio book was keeping the energy up. I'll be posting an excerpt in a couple of weeks so you can let me know if I fared any better! I like it here William. The Secret History is also a fair comparison, and a better book than Less than Zero (Brideshead I recommend, plus you can then watch the truly excellent TV adaptation which is very cleverly done). The Line of Beauty is my next Hollinghurst, but as I said somewhere else recently I can only read one of his about every five years and I still have a couple to go from Folding Star. Have you seen the film Metropolitan? Somehow I was reminded of it. Anyway, I agree with your last para. I recall though reading Arlington Park which focuses entirely on rather comfortably off housewives and thinking - if this were set in 19th Century Paris I'd have no qualms at all, that I do here speaks more to my prejudices than the subject matter. Perhaps part of the skill here is taking us past our own preconceptions about the characters? Audiobooks, recording those does sound rather challenging. What do you do if you don't like the book? Is it a question then of just acting, dear boy, to paraphrase the apocryphal Olivier? Thank you Max, glad to hear that you'll be coming back again in the future - you're comments are always very thorough and illuminating. I haven't seen Metropolitan but a quick look at it online and I can already see what you mean. I think prejudices have a large part to play in it. I, for one, find it hard to care sometimes about the heartaches and privations of the upper-classes given their social status. The danger with a book like this would be never really caring about a man who is so rich he doesn't have any sense of responsibility. I could very easily have found myself thinking 'Oh boo-hoo, you rich sod! ', but that's just my penury speaking. As for audio books, they involve a lot of (unpaid) time for preparation and are pretty tiring to record given that it's just you talking and talking and talking for hours on end. I've been incredibly lucky so far with the books I've done, I haven't disliked any of them, although some were easier than others. Keeping characters differentiated and the reading energised are the two biggest challenges. You'll be able to hear an excerpt from this book at the end of the month. An excellent, thoughtful review. It's quite a talent to be able to say this much about a novel, without giving too much away. I'm pleased I found my way hear from dovegreyreader, and will be adding your blog to my feedreader. 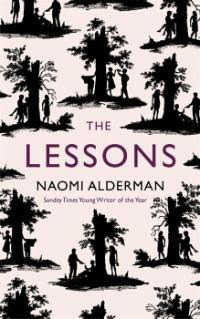 So far I've only heard rather than read 'The Lessons', courtesy of the Radio 4 reading already alluded to. Listening to it, I was very much aware of the echoes of Brideshead: Oxford, a big house, a narrator from a relatively modest background who gets drawn into the circle of a wealthy but troubled young man with an attachment to the Roman Catholic faith. There is more to it than that, of course. It is perfectly legitimate for writers to re-tell similar stories. After all, isn't it sometimes suggested that there are only seven basic plots? Thank you David for your kind words. The reading I was alluding to was actually my recording of the unabridged audio book (someone else did the Radio 4 excerpts). You can hear my version by clicking on the audiobooks button at the top of the page. Christopher Booker wrote about the seven basic plots in a book I haven't read but which friends have reported is an eye-opening look at story telling. Knowing that you don't have to invent a new one in order to write a legitimate story can be liberating for the writer I understand. Originality can be found elsewhere in the writing. William, fear not, I was aware that two different audio versions had been mentioned in comments and that it was Rory Kinnear on the radio. Apologies if I caused any confusion. It might be all to the good, if we mention your name often enough in the same breath as Radio 4, you could end up getting hired. After all, Douglas Hodge and Bill Nighy must need a rest every now and then? I haven't read this one, William. I read Alderman's Disobedience and was a little surprised at the rave reviews it garnered as well as the Best Newcomer Award at the Orange Prize 2006 it scooped, because it seemed very ordinary and unexceptional to me when compared with others on the 2006 longlist. For example, I adored the Sue Miller on that longlist (Lost in the Forest), which was a fantastic exploration of sexual awakening and a mourning family.I thoroughly enjoyed Zadie Smith's On Beauty, although perhaps it didn't reach the same heights for me as her fantastic debut. I loved Nicole Krauss's History of Love, which made me laugh out loud and weep, and found Hilary Mantel's Beyond Black spookily compelling. I liked Ali Smith's The Accidental, really liked Jill Dawson's Watch Me Disappear, admired Helen Dunmore's House of Orphans (although I seem to recall it had some disappointingly black or white characters; a surprise as Dunmore is usually so good at capturing nuance and shades of grey.) And I enjoyed Curtis Sittenfeld's Prep too. The only ones I read on that longlist that disappointed me were the Meg Wolitzer (unexceptional imo) and Marilynne Robinson's Gilead (I found it insufferably heavy going), although I was also bewildered by the accolades received by Sarah Waters for The Night Watch which again struck me as accomplished enough but ordinary in prose and derivative in gimmickry (backward chronology.) In such a strong longlist I was amazed when Alderman received such plaudits and the best newcomer award. I haven't read Disobedience Leyla but amongst such august company on that Orange list the judges obviously liked something (maybe there weren't many newcomers that year!). The Lessons is a book that gets better as it goes along. The comments here have highlighted the debt it owes to other books and when a novel is that derivative then it hinders the degree to which it can stand out on its own.